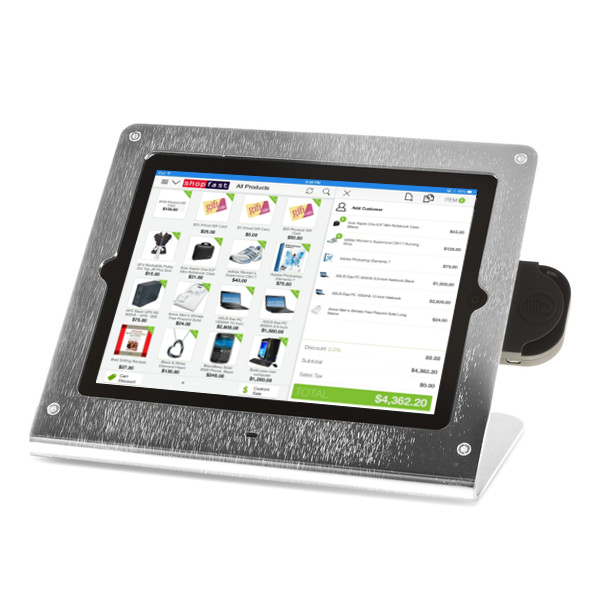 The WindFall iPad POS stand is beautifully sleek and smart, complementing your iPad and your POS app. This premium edition is laser-cut from one thick piece of high-grade stainless steel, directionally brushed, then electropolished to create a beautiful finish with extraordinary shine. Perfect for high traffic installations. Attach the iDynamo Credit Card Swiper to either side of the iPad depending on your preference (or employee handedness) to securely swipe cards. The front of the WindFall presses against the swiper so it stays tightly fastened to the iPad. Note: iDynamo integration only available in iPad 2 and iPad 3 non-retina display because it plugs into the 30 pin port. Stainless Steel Frame, Backplate, PivotTable disk, optional Adhesive strips, Tamper Resistant Screws, Security Hex Key, Plastic Washers, 4 Sliding Feet, 4 Non-Sliding Feet. For iPad 2, iPad 3, and iPad w/ retina display only. Built in the USA by Heckler Design. iPad, uDynamo, iDynamo, and Kensington lock not included.